Emily Seteiyo is dedicated to reducing the high infant mortality rate in Kajiado, and she’s going the distance to make it happen. 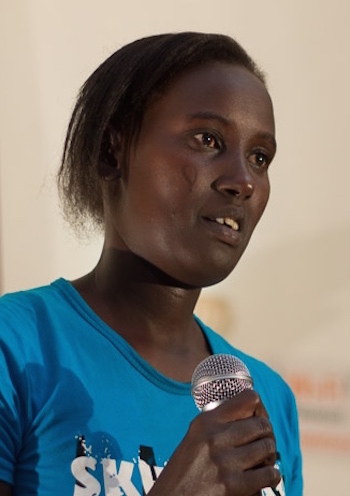 At times, she walks up to six miles to protect just one baby from HIV. Because doctors and nurses are out of reach, rural women often turn to traditional birth attendants to assist them during labor. Unfortunately, many attendants don’t have the proper equipment or training to prevent HIV transmission between the mothers and infants under their care. Emily stands with the vulnerable women of Kajiado. She empowers them with the resources they need to have safe deliveries and healthy babies – even when the mothers are HIV positive. Emily visits mothers in their homes and counsels them about the benefits of giving birth in health centers because in the hospital, there are gloves and equipment that prevent the spread of HIV from the health caregivers to the mother and child. Giraffe Heroes Kenya wishes to recognize Emily Seteiyo for ‘sticking out her neck’ for the common good and her desire to lighten the loads, strengthen the hearts, and improve the lives of those in his circle of influence.